Add Some Gusto To Your Shower – Install A New Shower Head! Everyone enjoys a long, relaxing shower. However a broken or leaky shower head will take away from the experience. Often older shower heads become clogged, or were poorly designed to begin with, which can curtail water flow and minimize the amount of water available for your shower. Whatever the reason, if you are not looking forward to your shower consider purchasing and installing a new shower head. When shopping you will find that new technology has improved water efficient shower heads. It is now easy to find a energy efficient shower that will bring back that enjoyable shower experience, and you don’t have to spend a fortune either! Turn off the water source. When possible, find and use the water shut off in the bathroom so that others in the house are not inconvenienced by the lack of water. If there is not a shut in the bathroom, turn off the water at the main water controller to the house. Some shower heads require assembly before being installed. Follow the manufacturers directions to carefully assemble the new head to be ready. Check and make sure that there is a washer in the new head. If not, press a washer in to keep the head from leaking. Look for flat spots on the neck of the old shower head. Place a wrench on these flat spots and unscrew the old shower head to remove it. Remember the old saying, “lefty loosy, righty tighty”, and turn the wrench counter clockwise to remove the head. 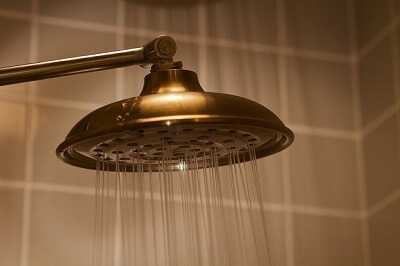 To make sure that the new shower head will not leak, thoroughly clean the threads on the connecting pipe. Then wrap the pipe with Teflon tape. Wrap the tape in a clockwise direction so that it will not come loose when the new shower head is attached. Be careful to keep the tape within the threaded area so that it will not show when the new head is installed. Use your fingers to make sure that the tape adheres to the pipe. Believe it or not it is this simple, just gently hand screw in the new shower head. If it needs to be tightened further, wrap the head with a cloth to protect it and use a wrench to further tighten it. Now turn on the water to make sure that the new shower head does not leak. If it does leak, re-tighten the shower head. Hand tightening is suggested to prevent moving or damaging the washer. As suggested above, if a wrench is needed, wrap the shower head in a soft cloth before tightening. Check for leaks again and repeat the above process until the shower head no longer leaks. Showers are one of those luxuries that people take for granted. No one is happy when the enjoyment diminishes. Fortunately, as indicated above, it is easy to install a shower head when needed. It is in fact so easy to install a shower head that the change may not be necessary, but just a desired change in the type of shower head used. So don’t be afraid – be a hero, and bring back the luxurious shower experience.